Bee hive frame perches or holders are tools that can be hung onto the side of the hive body or the honey super when the beekeeper is examining the colony or harvesting honey. They help to keep the frames off the ground and allow the beekeeper to keep his or her hands free so as to pull out the frames. In this articles we’ll examine selected bee hive frame perches, to determine which ones you should avoid and which you should get. This perch attaches to the side of the beehive by two clips. You can use this perch to hang the frames when you take them out of the hive. Whether you’re harvesting honey or just checking on the progress of your colony, the Primeonly27 Side Mount Bee Hive Frame Holder Perch is intended to be your extra pair of hands. Unfortunately this bee hive frame perch is not the best. It it somewhat shoddily built. The clips are not attached securely enough to the spine of the perch and they tend to fall apart. Another complaint is that it is too big to hold a standard sized beehive frame. You may even have bend it to make the frames fit. When the frames do fit, the perch only holds 3 frames at a time. Although this frame perch has its good points, there were more bad points than good. If you are looking for a frame perch that will last then you might not want to invest in this one. It weighs 10.4 ounces and measures 18.5 inches long, 6.5 inches wide and is 3.7 inches tall. 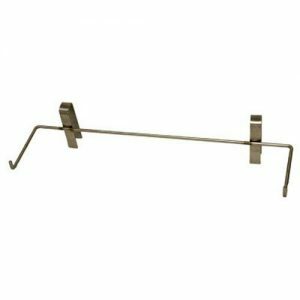 The Ahoer Bee Hive Holder Perch is made from stainless steel and can support up to 3 frames at a time. It has 2 clips that are used to mount it onto the hive body or the honey super. This perch is inexpensive and can hold both deep and medium frames. It can even support frames that are filled with honey so you can use it while harvesting. It is lightweight so you can easily carry it around with you, especially if you have multiple hives. Unfortunately this perch is manufactured in China so when you order the bee hive frame perch, it will take some time before it arrives. Usually it takes about a month or more to get to you, depending on where you live. There is also the chance that when it does arrive it will be damaged. In some instances the perch arrived with manufacturer’s defects and had to be returned. If you need a frame that you can use right away, then your best bet is to purchase one from a manufacturer closer to you. It measures 48 inches in length. It weighs 12 ounces and is 13cm wide and 9 cm high. 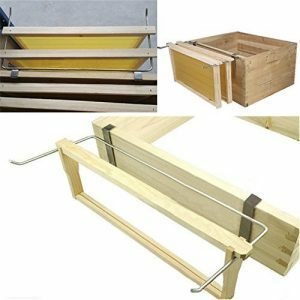 The WDDH Beekeeping Side Mount Bee Hive Frame Holder Perch is inexpensive yet durable. 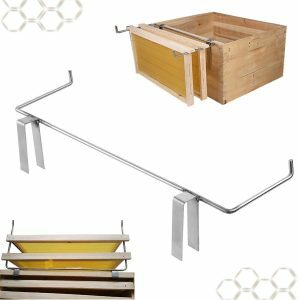 Made from stainless steel, this lightweight frame perch can hold up to 3 beehive frames at a time. During harvesting, this frame holder should be able to hold 2 to 3 frames filled with honey. Stainless steel is a weather resistant material which means that this perch can be used in any kind of weather conditions or climate. 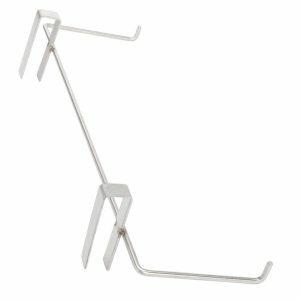 The WDDH Beekeeping Side Mount Bee Hive Frame Holder Perch measures 46cm x 17cm and has two hooks on the spine that you use to attach it to the hive body or honey super. Stainless steel is also durable and strong so that means that this frame perch is going to last you a very long time. This bee hive frame perch can hold up to 3 beehive frames at a time. 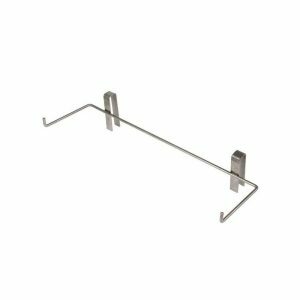 The QDSH Stainless Steel Beekeeping Frame Holder Bee Hive Perch is inexpensive and durable. It has two clips that are used to mount it to the honey super or hive body. This perch will help keep your hands free while you are examining your hive’s progress or harvesting your honey. The QDSH Beekeeping Frame Holder is strong enough to hold at least 2 deep frames filled with honey. This frame perch is also rust resistant which means you can use it in any type of weather. It measures 46.8cm long, 13.5cm wide and 9.5cm high. It weighs about 0.29kg. 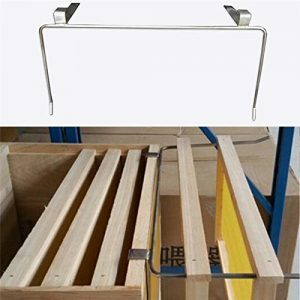 This inexpensive stainless steel bee hive frame perch has two clips which the beekeeper uses to mount it onto the honey super or the hive body. The perch is made from stainless steel, this means that it is weather resistant, light weight, strong and very durable. 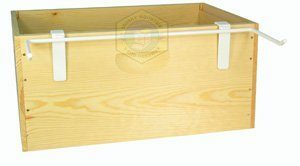 It holds up to 3 beehive frames and is good for both hive inspections and harvesting honey. The AMZT bee hive perch can support the weight of up to 3 deep beehive frames full of honey. The perch is easy to carry round. If you have more than one hive, you can easily carry this bee hive frame perch from one hive to the next while you harvest your honey or do your hive inspections. It measures 47cm long, 12.5cm wide and 9cm tall. It weighs 0.302kg. This beehive frame perch is lightweight yet durable and can support up to 3 deep frames full of honey at a time. It clips onto the side of the hive body or onto the honey super via two clips that are welded onto the spine of the perch. When mounted onto the hive, the perch provides a place for the beekeeper to put the frames that he or she takes out of the hive. Whether you are examining the health of your colony or harvesting honey, the Allied Precision Industries Beehive Frame Holder will stand up to the task. Since it is made of stainless steel, the frame perch is weather resistant and easy to carry around with you. No matter how many beehives you have, you can always use this bee hive frame holder. It is made from stainless steel and measures 50.8cm in length. It has a width of 13.97cm and a height of 20cm. 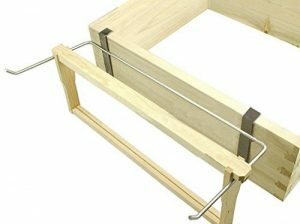 This inexpensive beehive perch is made from stainless steel and can hold up to 3 beehive frames. You can attach it to the honey super or hive body by the two clips welded onto the spine of the perch. Its stainless steel construction means that it is lightweight and durable yet very strong. The frame perch is resistant to rust so you can use it in any kind of weather or climate. The Yingte Stainless Steel Bee Hive Perch is strong enough to be used during harvesting honey. It can hold up to 2 or 3 deep beehive frames filled with honey. This frame perch will come in handy to ensure that the beekeeper has a place to store the frames as he is taking them out if the hive. The perch is like an extra pair of hands. It holds the frames you take out and leaves your hands free to take out the rest. The perch is 48cm long, 13cm wide and 9cm tall. 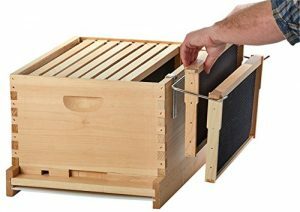 The Harvest Lane Honey frame holder is durable, yet light weight and inexpensive bee hive frame holder can support up to 2-3 beehive frames at a time. It can be mounted on the side of the hive body or honey super by 2 clips welded onto the spine of the perch. This easy to use perch can be used during hive inspections and while you’re harvesting honey to hold the beehive frames coming out of the hive. This way you don’t have to put the frames on the ground and they stay clean. It weighs 10.9 ounces and measures 12 inches in length. It is 12 inches wide and 3 inches high. This beehive frame perch is made from stainless steel and comes in two different forms. The first form of the bee hive holder comes as two separate brackets that you clip onto the hive body or the honey super. Each bracket measures 31 cm long, 25 cm wide and 3 cm high. Each one weighs 0.35kg. The brackets can be adjusted to fit the width of your hive no matter what kind of hive you own or the size of the frames that you use. They can hold up to 3 deep or medium beehive frames. They are easy to carry around since they are small enough to fit inside your beekeeping kit. 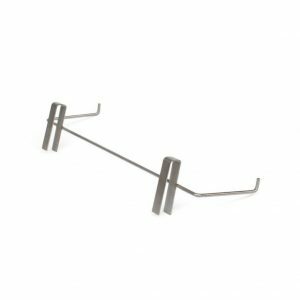 The second form of the Janolia beekeeping frame lift support brackets is the basic perch with brackets soldered onto a perch spine. This form is just as strong as the other. It weighs 12.8 ounces and is 47 cm long. The perch is 15 cm wide and 9 cm tall. It can support up to 3 beehive frames even if they are filled with honey. Both forms are made from stainless steel which means that they are rust and corrosion resistant. It also means that they can be used in any kind of climate or weather conditions. No matter what form of the Janolia beekeeping frame holder you choose, you will still get a durable perch for your beehive frames that is lightweight yet strong enough to support the weight of 3 beehive frames filled with honey. Although the two forms are priced differently, they are still inexpensive and are a great value for the price. This American manufactured frame perch is made out of white powder coated steel which is strong and sturdy. It holds up to 4 beehive frames at a time. You attach the frame perch to the hive body or the honey super by the two long clips on the spine. This is a must have hand tool whether you are examining your hive for mites or just making sure that your queen is laying brood. Hang your frames from the perch as you take them out of the hive to keep them off the ground. You can also use this perch while harvesting honey. It is strong enough to hold three deep frames filled with honey. Bear in mind that this frame perch is made out of steel so expect it to be a little heavy. If you have more than one hive it might be little difficult lugging this bee hive frame perch around from hive to hive. The white powder coating does make it resistant to rust and corrosion but if the powder gets rubbed or scraped off then rust and corrosion will occur. The Farmstand Supply Frame Perch Tool is more expensive than others, but this is a good thing as you get quality for your money. So if you want a quality product and don’t mind the price, then this frame perch by Farmstand Supply is the one for you. It weighs 1lb and measures 19 inches long. It has a width of 8 inches and a height of 4.2 inches. Using a bee hive frame perch is better and healthier than putting the frames on the ground when you take them out of the hive. Dirt and parasites like the varroa mite might be able to get into the hive by getting on the frames when you put them on the ground. That’s a chance that you should not want to take as a beekeeper. The above mentioned bee hive frame perches gives you an idea of what’s available on the market and the ones that are worth your consideration. For more information on beekeeping tools, check out our articles on the best hive tools, best frame grips and the best uncapping needle rollers. Do you own any of the bee hive frame perches on this list? Which frame perches(s) do you think should be added to this list? Leave a comment below and let us know.